At Ashley House, we are proud to be known as one of the most eco-friendly printing companies in the UK. We recognise the importance of environmental protection and do everything we can as a business to ensure we leave the lightest possible footprint - that’s why we support the Woodland Trust, the UK&apos;s leading woodland conservation charity as part of their Carbon Capture Scheme. As part of this scheme, we agree to purchase at least 60 tonnes of carbon captured paper every year; one tonne of paper purchased by us equates to 1854m² of new woodland planted and half a tonne of CO2 captured. In 2017 alone, we removed 71,664 kg of Carbon Dioxide and created 1,791.59 m² of new native woodland in the UK. UK woodland is under threat with thousands on the verge of dying and needing careful restoration. To rectify this, the Woodland Trust wants to see a UK rich in native woods and trees, for the benefit of people, wildlife and the environment. Over the next 10 years, they aim to plant 64 million trees and need as much help as possible to make this happen! Being part of the Carbon Capture Scheme helps us reduce our carbon footprint by contributing to tree planting efforts in the UK. As part of our commitment to the scheme, once a year we volunteer a day of our time, pull on our wellies and get stuck in tree planting in local woodlands. For the third year running, we visited Pullabrook Woods in Bovey Tracey which is a mix of ancient woodland and PAWS (planted ancient woodland site). We spent the day working alongside the Woodland Trust and Premier Paper Group, clearing ground and planting new native woodland. 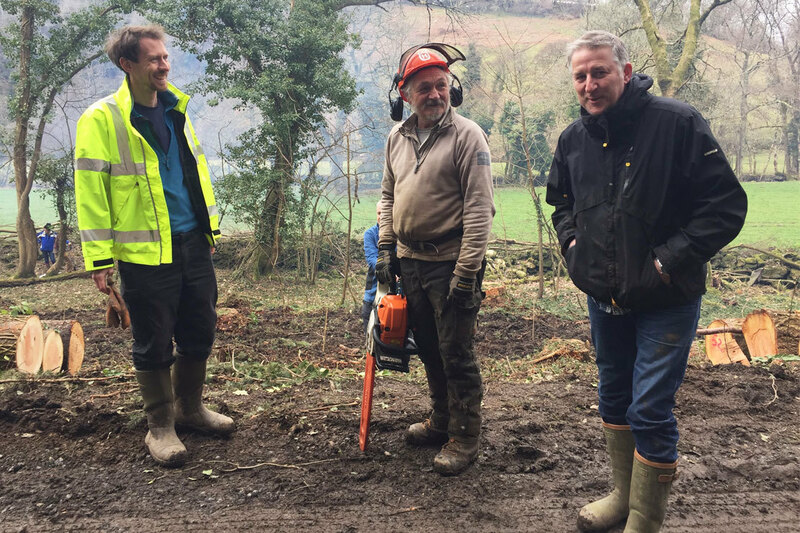 It was a busy day and we planted a total of 800 trees - mainly oak and hazel, with some rowan and alder mixed in, and cleared 2 acres of ground, which is done due to the vast quantities of brash which cover the floor following tree felling. The day left us with a great sense of achievement, knowing it will help make the Woodland Trust’s 10 year plan reality! By producing sustainable print, we can improve your carbon footprint too. If you would like to use the Woodland Carbon logo on your print, get in touch on 01392 202320 or hello@ashleyhouse.co.uk.